Hillbilly Hot Tubs Rates: Payment is due at the time of hot tub service unless otherwise authorized. If a payment is not made at the time of service, payment in full is due within 15 days from the date of the hot tub service. On the 16thday, late fees will be added every 30 days until payment is received in full. If you do not contact us within 5 days with a bill dispute and payment is not received within the terms outlined above, your file will be sent to collections. The customer is responsible for any and all court costs, collection fees and attorney fees. There is a $50.00 returned check fee, in addition to any fees the bank may charge. Cancellation: Please call Hillbilly Hot Tubs 24 hours prior to the appointment for cancellation. If the technician arrives at your home to find you have cancelled, there will be an $85.00 trip fee. Access: The technician must have full access to the hot tub, electrical power, and water supply. If he arrives and does not have access to these, you will be called to reschedule and a trip fee will be added to the bill. 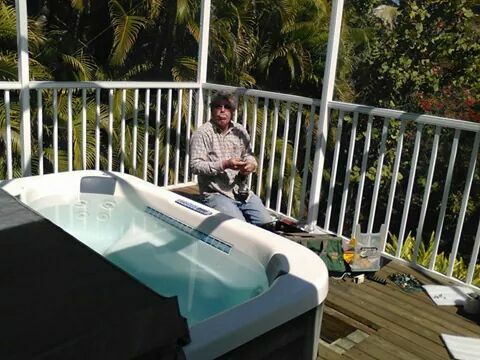 Weather Conditions: Due to the fact that the technician has to handle electricity, sealants and other various items, weather plays an important role in the repair of your hot tub. Please be patient. For rain cancellations, our policy is to reschedule you within 7-14 business days of the original appointment. Returns and Credits: Installed parts and product is not returnable. There is a 15% restocking fee on returned merchandise. Special order items are non-returnable. We will work with you for warranty issues, but the warranty is through the manufacture of the items, not through Hillbilly Hot Tubs, so it is case by case to how the warranties are dealt with. Parts and Repairs: All special order parts are to be paid for in full prior to ordering. No Exceptions. Some parts have a manufactures warranty; this warranty is through them, not Hillbilly Hot Tubs. The customer is responsible for labor charges to remove and install warranty parts, along with the freight to and from the warranty company. Leak Repair: Be aware, leaks are time consuming. Hillbilly Hot Tubs policy is to repair the leaks we can see, are obvious. After that leak is repaired, it is not uncommon for other leaks to appear. At that time we will make an appointment to repair the next leak. This could go on for an extended period of time, especially in “full foam” tubs. We will advise you upon our first service call to if we think the repairs are worth it, this is a judgment call and you must make the final decision. There is NO WARRANTY on leak repairs from freeze ups or glue failures or any other failing plumbing. Customers Responsibility: It is your responsibility to contact us within 5 days of any problems. This includes parts not functioning properly or leaks. After the 5th day, you will be charged for a new diagnostic fee. During cold winter months, it is your responsibility to keep the spa from freezing. We will help direct you to do this, but we are not responsible for spas that freeze. Trip Fees: If your tub is located out of our local service area, you will be charged a trip fee of $1.00 per mile. We only charge for time spent working on the tub, not door to door such as many others. There is a 1 hour minimum. In most cases, this comes out to be less money than door to door charges. Tub Assessments/Estimates: If you have us come out to look at the tub and assess it for repairs, there will be a service charge to do so. If you decide to have the work done by us, that fee will be voided with exception to those who are outside out service area, in which the trip fee portion would still have to be paid to cover fuel. If the tub is not repairable, you will still be charged the service and trip fees, unless you purchase a new tub from us. Phone orders: We you call to place an order over the telephone, we are doing our best to get you the item you are describing. If it turns out to be the wrong item, costs to ship back and forth will be your responsibility. If it is a special order item or electronics, it may not be able to be returned. The above stated policies apply to all of our sales and service, not just hot tubs. Anything will sell or repair through Hillbilly Hot Tubs falls under the same customer service policies. If you have any questions please ask us when you are speaking to us, we are more than glad to help. The reason we have put these policies in place is to protect us from the few people out there that abuse their rights as customers. We are very easy to get along with, and have hundreds of references if you need.